If you are thinking about hair extensions ask yourself this, How long do you want them to last? How much maintenance are you prepared to do? And how much do you value your own natural hair? 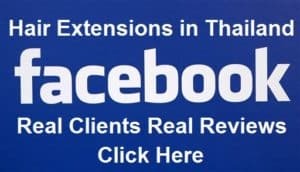 Unprofessional methods for hair extensions can damage your own hair, Hair extensions in Bangkok are not hard to find, but if you are looking for the best hair extensions money can buy, even on an International level. 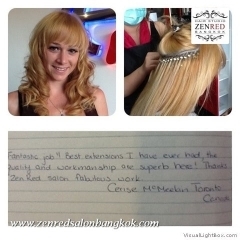 Zenred Salon Bangkok has exactly what your looking for: The Best of The best but for a lot less, would be our Premium Grade Hair Extension Range, exclusive to Zenred Salons. Our premium grade extensions can last up to 12 months, some of our clients have returned to us and even had them last much longer, ofcourse it depends on the care and lifestyle one leads but there are not many hair extensions in the World that will last as well as ours do. Our Premium Grade Extensions are different, we never use factory processed hair or cheap Chinese hair collected from salon floors. We only use 100% virgin Remy hair that has never ever been coloured or treated, we then work our magic by custom producing them strand by strand, colour matched exclussively to your own hairs hue, then designed and applied specifically to match your head and where you need extensions the most. Our Premium Grade Hair extensions come with a Free colour matching service, this means we will match them exactly to your own colour. Other salons will give you single drawn quality and the closest color they have on the rack, always resulting in streaks or obvious tell tale signs that your hair is not your own. However if you choose to have our Premium grade Double Drawn hair Extensions, We will lovingly prepare your extensions with top quality products before installing them into your own hair. Even better, Our Premium Grade Extensions have been known to last 12 months or longer. Its not just enough to throw some Hair extensions in and hope for the best, they need to be carefully planned and then the hair cut and layered to get a more natural look. We offer this Free to all our hair extension clients. Still not enough? We will provide a free shampoo blowdry and style after installing your extensions, making curls, waves or silky straight red carpet look. We have years of experience and you will look amazing, guaranteed! Premium quality extensions in the USA or UK can quite easily cost 1000usd, we have met many clients that have paid this before and asked us to remove them. We have found the quality of these extensions still do not match ours, to get 12 months out of hair extensions is pretty amazing and excellent value for money. However, if you are on a tight budget we also offer standard grade hair extensions at Zenred too. Similar to what other salons offer, these are typically single drawn standard quality extensions. The colour will be what is available on the rack and closest to your own. These extensions last approx 3 months and require more maintainance as the quality is not as good as Premium. We offer this service but most clients prefer our Premium Services as they are way better value and less maintainance and just amazing! Its simple, cheap quality factory processed hair extensions require far more maintenance and looking after than good quality ones. And even then they can only last 3-4 months. We will provide instructions and products to help you get the best out of your hair extensions, including special hair extension brushes and Argan oil’s and everything you need to know to get the best from your Zenred Hair Extensions. We use the latest Professional technology and techniques, we do not use cheap toxic silicone glue or wax to apply extensions. These are simply cheap market stall techniques designed to look good for a week and will damage the hair greatly. Our 2 most popular methods are Keratin Fusion Bonds and Micro Silica Links. Both methods are safe for the hair, reduce damage to real hair and are easier to remove, readjust and reapply. How Much do Zenred Hair Extensions Cost? It depends on what colour you want, what length, what grade quality and finally how many Grams. We have a detailed price list (click link below) to help you work things out. All prices are based on 100 grams which usually is enough for a standard Full head. However for clients with very short hair who want rather long extensions, or perhaps very thick hair you should add extra bundles to get the volume to match the length. However it is entirely up to you, you can always come back at a later date to add more if you want. Need More Information or Details on our Hair Extension services?